The Audioengine A5 & S8 combination is an impressive speaker system that’s worth every penny, but you will need a lot of pennies. [ad#Google Adsense 300×250 in story]As you may know, audio is extremely subjective. What is perhaps too quiet for one person may be too loud for another. Some prefer brighter, crisp sound, while other like to feel the bass response hit them in the chest. It is all a matter of personal preference and this is something that is worth repeating. With that said, the quality of any given listening device may be measured by its capabilities for reproducing excellent quality audio so, no matter what you listen to or watch, you hear everything in a way that’s to your liking. While some people will use just about anything to make their music audible, there are many who are more critical and prefer to avoid potentially painful, harsh, brittle sound. For this particular product combination, great sound comes at a higher price. Some may question it, others may challenge it, a few may complain about it, but for those who experience it; you may find an appropriate balance of performance, price, and premium sound for your compressed audio, video, and gaming. Unlike so-called “computer speakers,” which these are not, this is a speaker system that just happens to offer 1/8-inch stereo connectivity and USB power for devices, like computers, iPads, iPods, iPhones, etc., so that you might enjoy them as well. These are also not your everyday speakers you would find at a departments store; Audioengine speakers are in the category that is commonly referred to as “Advanced Consumer.” This essentially means that they are better quality for those who appreciate the difference without going over the $1,000 price point into audiophile territory. Surprisingly enough, those who are critical listeners may find that the A5 ($349) & S8 ($349) combo is a perfect addition for them as well. This is a highest quality audio output from a 1/8-inch stereo input available in this category and it stands up to all of its competitors easily. Speaker placement does require some consideration since these are not “monitors” by any means and are not really at their best for near field listening (close range to your ears). You want the sound wave to develop and having them at or just below ear-level at 5 to 7 feet away gives you a lot more of the dynamics sometimes missing from compressed audio (like iTunes AAC, MP3, etc.). Setting up the A5’s on your desk, for example, doesn’t allow the low mids and sub frequencies to develop and you’ll just end up with some treble for your troubles. This can be compensated for with the iTunes EQ, if need be, but you will want some distance to get the full effect of these speakers. This is really one of the ultimate ways to enjoy computer audio. Connectivity includes options for wireless audio input (either by Audioengine’s optional W1 adapters and W2 Connector, or via AirPlay with an AirPort Express which connects to an additional power port on the rear of the A5), or by simply connecting your iOS device to one of the two hard-wired 1/8″ stereo input connectors and separate USB connector for power. Both the design and feature list for the A5 & S8 combo are well thought out and impressive. From the drawstring bags for the accessories and cabling to the tactile appeal of the solid construction of the speakers, themselves, you know that you have something special when begin to connect the system. Everything you need, for a huge variety of configurations, is included. Just connect the S8 to the sub-output on the A5, connect your power cables, and select your input method of choice – that’s all you need to get started. The A5’s passive crossover two-way configuration features 5″ woofers made of Kevlar, the nearly indestructible material found in bulletproof vests. For all of their toughness, both the A5 and S8 cabinets are slick, simple, and elegant in appearance. 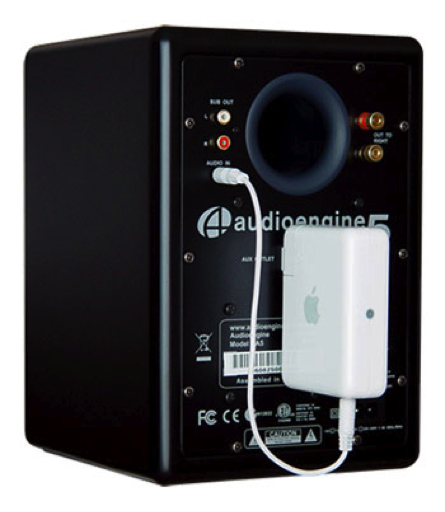 Audioengine even includes foam isolation to absorb some conductive frequency resonance from their placement surface. The real key to getting the sound of this killer combo just right is to adjust the level of the self-powered S8 sub. Starting with the A5’s level adjustment knob on its face at 12 O’clock, positioning the S8 in your room properly will directly affect its sound. This is an 8-inch down-firing speaker assembly meaning that woofer is aimed at the floor and is mounted on the bottom of the housing. The front-facing port allows air to move as the sound wave develops dynamically. Phase: It is an acoustical term meaning that proper adjustment prevents low bass response from dropping out when the A5 & S8 produce the same frequencies. When the speakers are IN phase, you will hear more bass in the listening area. When they are out, it may come and go depending on where you sit or stand in the room. Crossover: Which selects the frequency at which the A5 ends and the S8, in turn, begins producing its sound. Volume: This is the main output adjustment of the S8’s amplifier. The overall volume of both the A5 & S8 combo is controlled by the input device, and, with the S8 setting “fixed,” the A5’s volume adjustment can be used to attenuate (reduce) the output to match the S8. Start with your audio output device’s EQ set to flat or with the EQ turned OFF, if that is an option. With the S8’s crossover set to approximately 80Hz with the volume at 75 percent, the MacBook Pro volume was at just below the halfway point. The A5 output was visually at 10 O’clock to start. With just a few tweaks along the way, once the system is set up you can adjust the volume solely with your input device’s own output adjustment (volume). For the purposes of this evaluation, and given that these are not studio monitors (in spite of looking like they could be), the audio files selected were original ones that were recorded, mixed and mastered in-house, but compressed for AAC, MP3 and Apple Lossless formats. Each style of music has its own points of compression, audio signature, and preference for both player and genre. All styles and genres of music sound big without being boomy and things like a lower-than-low 808 drum sound would definitely make your neighbors knock on your door (or come in for the party). Guitars are full with just enough finger noise from sliding on the strings. Vocals are clear, present, and natural without any mush or chirpiness that is often associated with MP3 compression. Synth pads and keyboard sounds were articulate and sounded spacious without the need for any faux-surround 1Khz phase tricks the way that Bose colors their speaker systems. Reverb and delay effects are audible without being distracting, as well. Watching some iTunes movies and television shows was excellent with far greater speech distinction and sound effects, particularly the subtle things placed by a good Foley editor like a bus going by, side conversations, or glassware clinking. Playing games with the audio coming from these Audioengine speakers will make you break a sweat. Several Freeverse games, in particular, really have excellent audio quality and definitely make you turn your head thinking someone else might be in the room at times. It seems like there are so many choices, in so many price ranges, for speakers — because there are. Anywhere from $30 – 30,000, there are also as many variables in the entirety of the signal path, but that’s an article for another day. Please do not go by the specifications list on product packaging when shopping for most audio products. Your ears will tell you if it sounds good. 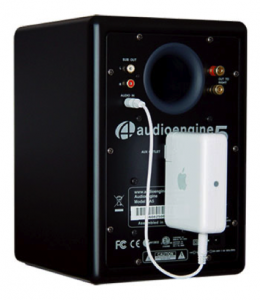 The Audioengine A5/S8 combo have a rather steep $700 price tag, but they really bring computer audio, especially compressed audio that is more and more becoming the standard, to the best quality output for your home or office. With a little time setting up this system to your listening environment, the results truly tell the tale. The Audioengine A5 & S8 combo is well-designed, beautiful audio from your compressed (or uncompressed) files that outperforms its closest competitors to a point where they simply should not bother trying to compete. While its pricing may preclude the more budget conscious, if you want your compressed audio to sound its best, start saving and get this setup when you can. It is definitely a guilty pleasure audio system… with the emphasis on the pleasure.